This is an easy knitting pattern for a simple yet elegant scarf slide using Berlini Memento Royale, a beautiful glittery ribbon yarn. The size and width of the scarf slide may be easily adjusted by varying the number of stitches and knit rows. The yarn used for this pattern gives the scarf slide a rich and glamorous look. Make one in every color to match your scarf. 2 versions are featured here and both are beautiful. 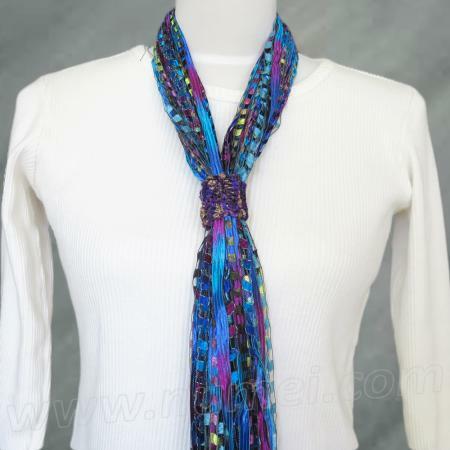 Width of scarf slide can be varied by varying the number of stitches. Size of scarf slide can be varied by varying the number of rows knit. Knit till piece measures 2 1/4". Sew cast on and bound off edges together. Knit till piece measures 1 1/2". Pattern for the knit ladder ribbon necklace may be found here.